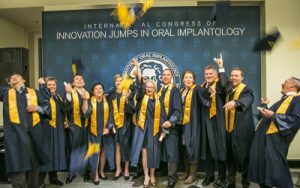 Master of Science in Oral Implantology (MOI) at the Goethe University in Frankfurt/Germany is designed for fully-employed dentists whose primary interest is in receiving advanced academic training in the field of oral implantology. After successful completion of the program, you will receive the academic title of “Master of Science (MSc.) in Oral Implantology”. You will be able to independently plan and implement therapy concepts for the treatment of patients requiring dental implant prosthetics. In addition, you will also have the skills required to select, analyse and fully integrate into your own practice a full range of treatments and knowledge in this field of dental implantology. Please use this website to learn more about investing in your continued professional success with our international part-time MOI Master’s Program. The Master’s Degree Program ‘Master of Oral Implantology’ (MOI) is designed for the general dentist who has already taken the first step towards the field of implantology. You have already placed implants and now want to develop your practical skills and build up solid, scientific knowledge in order to provide safe, appropriate and efficient treatments. The 2-year modular graduate degree program takes your time constraints and job responsibilities into consideration. You have to travel four times to Frankfurt during your course of studies. Each stay lasting between 7 and 10 days: you’ll have lessons and hands-on courses and thus grow through input from our international faculty, guest lectures and fellow students. In between the 4 residential periods, you’ll be treating patients in your own surgery, documenting and discussing the cases with our team at your own pace. After successful completion of the program, graduates will receive the academic title of “Master of Science (MSc.) in Oral Implantology”. The graduates will be able to independently plan and implement therapy concepts for the treatment of patients requiring dental implant prosthetics. In addition, graduates will also have the skills required to select, analyse and fully integrate into their own practice a full range of treatments and knowledge in this field of dental implantology.